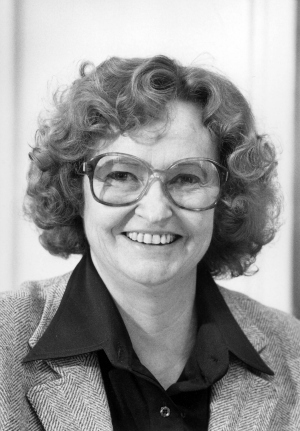 Gail Fullerton, the first woman ever to serve as SJSU’s president, passed away on Jan. 1 in Oregon. She was 88. “Our warmest thoughts are with the Fullerton family during this difficult loss,” said Interim President Susan Martin. Appointed in 1978, President Fullerton led our campus until her retirement in 1991. She was the first faculty member promoted to the university’s top leadership post since 1900. Her professional and personal accomplishments and other anecdotes are captured in an obituary published Wednesday afternoon. Funeral arrangements are pending. The California State University Board of Trustees is beginning the search for a new president of San Jose State University to succeed Mohammad Qayoumi, who left the CSU on August 17 to serve as an advisor to Afghanistan President Ashraf Ghani. The first meeting of the Trustees’ Committee for the Selection of the President will be held in an open forum from 10:30 a.m. to 12:30 p.m. on Thursday, October 15, in Morris Dailey Auditorium on the San José State campus. Members of the campus community, community‐at‐large and media are invited to attend. SAN JOSE, CA – San Jose State Interim President Susan Martin will highlight recent achievements and outline new initiatives during the Fall Welcome Address at noon Sept. 3 in the Student Union ballroom. This will be Martin’s first formal speech to the campus community since her appointment Aug. 18. Academic Senate Chair Michael Kimbarow and Associated Students of SJSU President LooLoo Amante will open the event and welcome attendees. All students, faculty, staff, community members and news media are invited to attend. Martin will be available to speak to reporters. The event will be streamed live and available afterward on the university’s website. The speech is an annual tradition marking the start of the academic year. 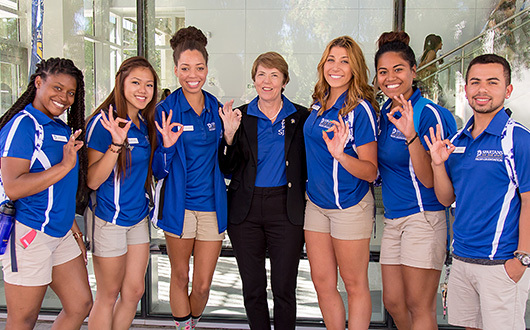 Interim President Susan Martin with freshmen orientation leaders (photo by David Schmitz). 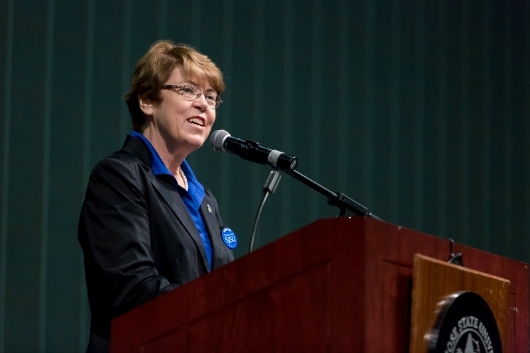 SAN JOSE, CA – SJSU opened the 2015-16 academic year with a reception welcoming Interim President Susan Martin to campus. Academic Senate Chair Michael Kimbarow introduced President Martin, who offered greetings and then took questions from the audience. View the video. The event was held from noon to 1 p.m. Aug. 20 in the Student Union ballroom. All students, faculty, staff, community members and news media were invited to attend. President Martin will deliver the Fall Welcome Address at noon to 1 p.m. Sept. 3 in the Student Union ballroom. All students, faculty, staff, community members and news media are invited to attend. The speech is an annual tradition during which the president reflects on the previous year and discusses the year to come. The event will be streamed live from the SJSU home page. In addition to the presidential transition, SJSU is proud to announce that our 33,000 students will begin the year with many new classmates, faculty members, classrooms and services. New students include 3,500 first-time freshmen, 3,500 new undergraduate transfers, and 2,000 new graduate students. SJSU has appointed 58 new tenure-track faculty members across the disciplines from biology to dance. This is a significant increase over years past, the result of enrollment increases and resource reallocations within the university’s $329 million operating fund. New administrators include Vice President for Student Affairs Reginald Blaylock, Vice President for University Advancement Paul Lanning, Dean of the College of Social Sciences Walter Jacobs and Dean of the College of Applied Sciences and Arts Mary Schutten. Students will find new furniture in 100 classrooms, new technology in 36 classrooms, new whiteboards in 35 classrooms and new seats in five large lecture rooms. The new $25 million Student Wellness Center is open for business and the $54.7 million renovation of Spartan Complex, which houses many academic and athletic programs, is nearly complete. The Student Union expansion continues, with a new Starbucks, Subway and Spartan Bookstore scheduled to open this term. A new residence hall is slated for completion in fall 2016. 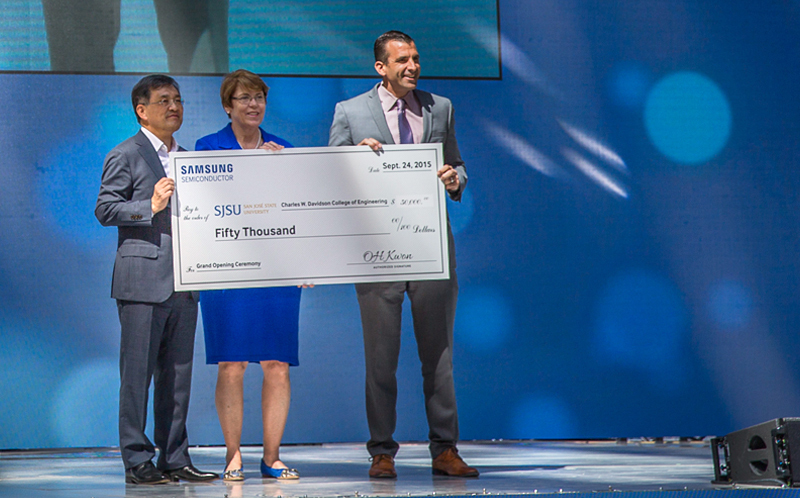 On Aug. 1, SJSU became a tobacco-free campus, with the goal of promoting clean air and a healthy environment while helping community members quit. This summer, students registered with the assistance of a new online tool. Spartan Planner offers a variety of scheduling options with one goal – graduating on time. Last but certainly not least, men’s water polo will become SJSU’s 20th NCAA Division 1 sport. Their first match is noon Sept. 5, against Santa Clara at the SJSU Aquatics Center. SJSU football kicks off its season 7 p.m. Sept. 3, taking on New Hampshire at Spartan Stadium. Posted by ABC 7 on Aug. 17, 2015. The president of San Jose State University is saying goodbye to his university life and beginning a new role as chief advisor to the president of Afghanistan.Monday was the last day on the job for Dr. Mohammad “Mo” Qayoumi, Ph.D. He leaves for Afghanistan later this week. We spent some time with Qayoumi recently, learning about his new job. “It was a major decision. It was not an easy decision to basically uproot myself,” Qayoumi said. Posted by the San Jose Mercury News on Aug. 14, 2015. There’s been a rush to judgment on Susan Martin’s appointment as the interim president of San Jose State University upon Mohammad Qayoumi’s departure. As she settles into the campus this week, we hope the faculty and community leaders will look at her overall record, not just the flash point of Eastern Michigan University’s Huron logo controversy. And we hope they’ll talk to her. It will be easy. Communication was not Qayoumi’s strong point, but it is Martin’s. A number of factors combined to turn local sentiment against Martin. The CSU chancellor appointed her quickly without consulting local faculty, who had expected someone within the CSU system. But opponents mainly have focused on her decision in 2012 to include an old Indian-head Huron logo as one of two historic logos on an inside flap of the university’s band uniforms.